Waste not, want not. The old saying is a cliche because it's true. In a restaurant kitchen, it's easy to forget about ingredients tucked away in the cooler or the walk-in. When it is rediscovered, it's well past its expiration date - so into the garbage (or hopefully the compost bin) it goes. Or perhaps a certain weekend special didn't sell as well as expected; it might end being thrown out on Monday. But this type of food waste is costly for restaurants. With budgets tight, restaurants need to save money whenever and wherever possible. Reducing food waste is something that restaurants should be doing, even in a good economy. Here are some simple steps to keep food waste in your restaurant kitchen to a minimum. Your sales rep may try to get you to buy several cases of lettuce or tomatoes because they are on sale. However, if you won’t use more than one case in a week, then you run the risk of food spoilage. And that equals dollars lost. Only buy produce on sale that you can definitely sell within a week. If it is something that isn't on your regular menu, have a good idea of how you are going to serve it to customers. This goes for everything in your walk-in cooler and freezer as well as in your dry storage. Not only does it ensure food safety, it helps you use older food first (FIFO) before they spoil. This should be part of your kitchen SOP (Standard Operating Procedure). Often cases of fresh produce will arrive at your restaurant DOA. That is, they are either spoiled or well on their way. This is why it is important to inspect your incoming order. If you (the owner) aren't in charge of checking in the food delivery, make sure that whoever is knows that they can reject cases of wilted greens or spoiled veggies. Don't be afraid to send the food back and speak with your sales rep. If this happens repeatedly, it is time to start shopping for a new food vendor. Even though beer and wine are not fresh per se, they are still perishable. Fluctuating temperatures can cause beer to have a “skunked” taste and makes wine bitter. So make sure your dry storage area, or wherever you store your beer and wine, is set at a constant temperature. 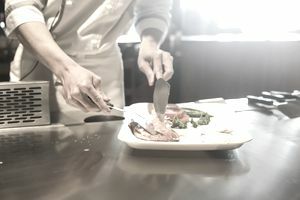 Food spoilage is almost impossible to escape in a restaurant kitchen. But you can minimize it by staying organized and only buying what you need. However, don’t get overzealous about tossing questionable foods. When in doubt, throw it out. A little spoilage is better than risking your customers' health. Anyone who has spent time working in a restaurant knows that Monday's soup special is usually recycled weekend specials. There is nothing wrong with creating a new dish from a previous day's specials (assuming the food is not past its expiration date - again when in doubt, THROW IT OUT). Repurposing leftovers into a new lunch or dinner special is a good way to reduce food waste. Food waste is not good for a restaurant budget or for the environment. Creating new specials out of repurposed ingredients is a good way to stretch your food cost and reduce the amount of food that ends up in the garbage. For those ingredients that you don't catch in time, adding them to the compost bin instead of the trash bin is another way to reduce spoilage. More and more restaurants are going green, implementing recycling and composting as part of their business model. Even if you don't have a restaurant garden to use compost, local farmers or gardeners would be happy to use it in their gardens. This is a win-win for both of you.